Ponds and water gardens enhance landscapes and create the impression of an oasis. These gardens require special plants that appreciate the humid environment surrounding the water and the damp, boggy soil. 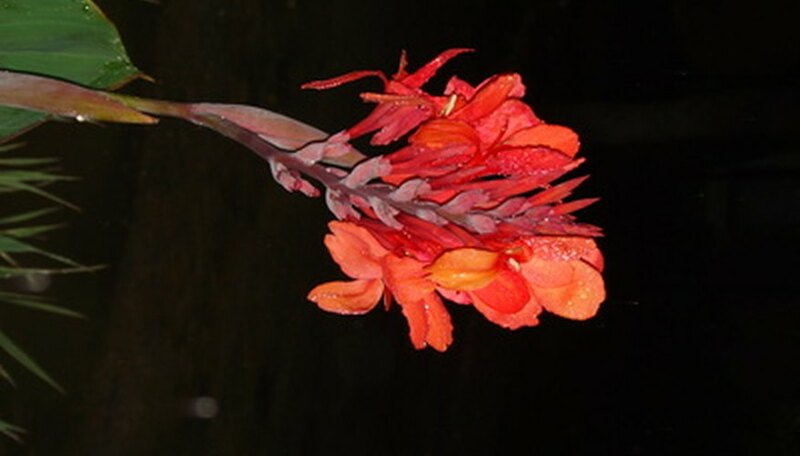 Water canna (Thalia) thrives in the moist environment of a water garden. These plants produce clusters of blossoms on the tops of their tall stalks. Water cannas add a graceful touch to boggy areas. To care for water cannas, place them in a pot and plant the pot near the water's edge. Select a planting location near the edge of your pond or body of water. Water cannas grow best near the edge of the water, not in the middle of the pond. Select an area that provides plenty of bright sunlight. Cannas prefer full sunlight but, like other types of pond flowers, tolerate areas with partial shade. Plant rhizomes about two weeks before the final frost in the spring. Place a layer of burlap in the bottom of a pot to keep the soil from seeping out. Hold the pot at an angle and fill about halfway with potting soil. Lay a rhizome on top of the slanted soil and cover with potting soil, leaving about 1 inch of space below the rim for gravel. Fill the remaining space with a layer of fine gravel. Clear a small area in the soil near the edge of your garden pond. Remove weeds and larger plants that may block the sunlight from your planting spot. Press the bottom of the pot into the soil in your pond to allow the rim of the pot to sit slightly below the surface of the water. Water cannas thrive in the boggy margin of soil between the edges of the pond to a level about 8 inches below the surface of the water. These plants tolerate shallow submersion, so don’t worry if the water level fluctuates a little during the growing season. Keep the weeds, algae and nearby plants cleared away from your planted rhizomes. Although these hardy bog plants grow quickly, they require occasional clearing of nearby invasive plants. Encourage healthy growth by treating water cannas with a fertilizer once a month during the growing season. Select a fertilizer formulated for pond plants. Leave canna plants in the pond over the winter if you live in the warm climates of USDA Hardiness Zones 6 or higher. In cooler climates, remove the pots from the pond in the fall and store the rhizomes inside during the winter to plant again the following spring.